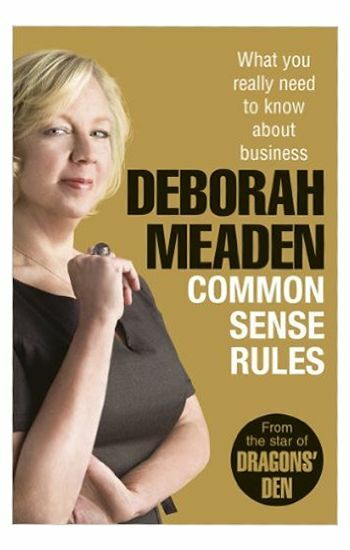 Deborah Meaden introduces readers to Common Sense Rules – and reveals the secrets behind entrepreneurial success. I am constantly asked if there is a blueprint for entrepreneurial success and I always say, ‘No, there isn’t’. Every venture is unique. Each has its own opportunities and own particular problems to solve and hurdles to overcome. There isn’t a single path to success – there are many. Nor are all entrepreneurs cast from the same mould. Having said that, I do believe that there is a mindset that many entrepreneurs share, and exploring this mindset is one of my main purposes in this book. Put in a nutshell, the entrepreneurial mind is founded on that least common of commodities – common sense. Common sense involves knowing how to go about asking basic questions and anticipating challenges. It involves learning how to deal with inevitable setbacks and disappointments. And it tells you when you need to forge ahead and when you should cut your losses. It’s not the easiest thing to acquire, but it is a skill you can hone and develop. The fact is that true entrepreneurs never stop learning from their own successes and failures – and from one another. In Common Sense Rules, Deborah also reveals her Top Ten business clichés. Number 1 on the list is ‘360-degree thinking’. The phrase ‘360-degree thinking’ should be put away in a locked box along with ‘blue sky thinking’, ‘thinking out of the box’ and countless other meaningless phrases that imply that otherwise one-dimensional, dull, uncreative thinking is the norm. Businessmen who pepper their language with these wretched clichés are just saying that they don’t have an original thought and they don’t have a good command of the English language either. Any business discipline requires creative thought, but creative thinking should be an everyday occurrence not simply trotted out when demanded and on special occasions. To read all ten of Deborah's top business cliches click here to buy the book.